Yes, without a shadow of a doubt, it's now low season, also called the wet season, rainy season, or the scary MONSOON SEASON! My home rain gauge, which I've now had for 2 years has recorded more than 250mm of rain in the last 2 weeks. From April 21st - 29th I am not sure of the daily figures, as we were not in Phuket. 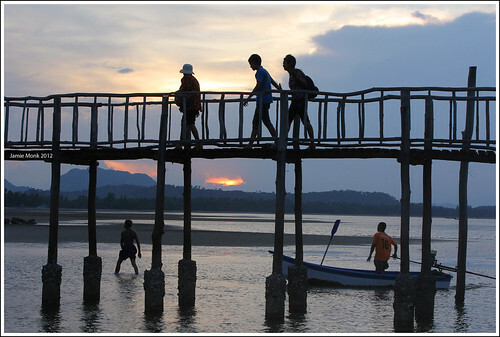 Most of that time was spent in Chumphon, my wife's home town about 400km from here on the way to Bangkok. 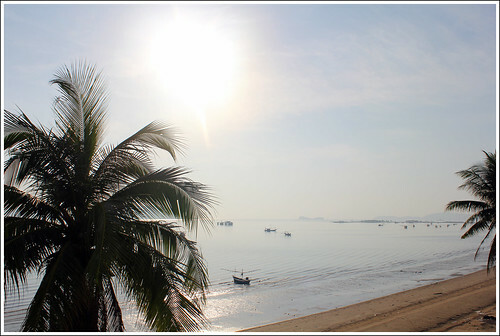 The weather there is different to Phuket, as Chumphon is on the east coast. While Phuket was getting some west wind and some occasional heavy showers at the end of April, I can tell you it was baking hot in Chumphon! We had a lot of family time and lots of days out too. My wife's sister lives by the beach, about 15km away from the town at Sairee Beach. This was the view from the balcony on April 25th, about 7:30am. Perfect. We visited one temple twice, the second time with my mother-in-law. The temple is called Wat Kaew Prasert, and is about 70km from Chumphon with a great view - the seaside views here are brilliant. There are miles of barely touched beaches. We also visited a small island, not easy to find, not easy to reach! Even the family had no idea how to get there! Koh Pitak is only about 800m offshore, about 40km south of Chumphon. Lovely little place. Having lived on a small island (Utila) for quite a while, I always enjoy finding small communities like this. Never fear! 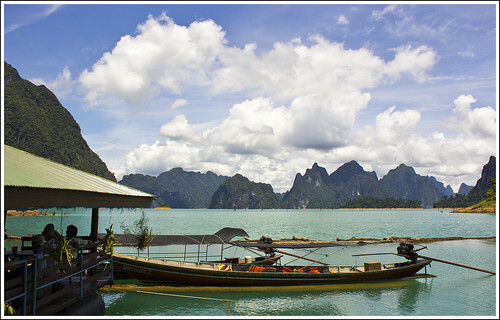 We had some holiday left, and after a largely sunny day on April 30th, we were back in Khao Sok on May 1st and had 2 very hot sunny days splashing in the lake, canoeing and tubing on the river. We stayed at Cliff and River resort as we have done before, and joined some tours organised by Easy Day Thailand. I have no photos of the tubing or canoeing - too wet! Not rain, but I mean everyone splashing about. A fun couple of days. And here's a little video I have posted to Youtube, early morning on May 3rd, before 7am. View from our room at the Cliff and River, with gibbon calls and all! And then on the 3rd, just before we checked out ... the rain came again, and was pretty wet most of the way home. It's been a fairly wet few days actually, not much sun on view. Some brief storms passing through, with strong winds now and then. 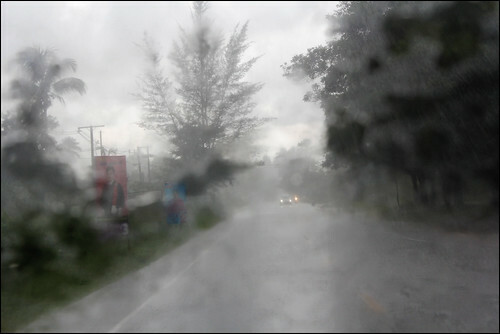 You can see the rain come and go on the video below which is a timelapse of yesterday's views from the Patong Beach Webcam. Right, low season here we go! I am back at work and surprisingly busy at Sunrise Divers. We'll be open pretty much every day in low season, 9am - 5:30pm. Today would have been a nice day to dive. Quite a bit of sun, and looks like the week will be OK, now that the initial burst of low season weather has passed. Low season I normally update more often, since the weather changes more often! Will also be on Twitter - do follow me @jamiemonk! And also, I tell you what, the low season is OK, weather is a bit wet sometimes, but largely decent, and there's one big plus - cheap hotels! 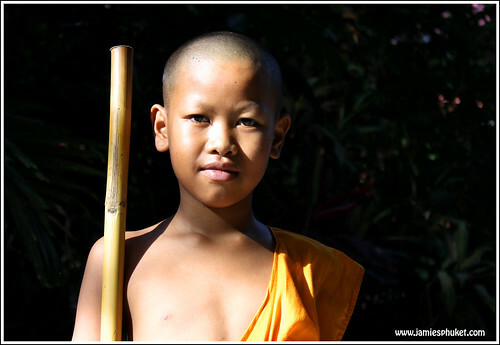 Have a look at Phuket hotels on Agoda for prices. You can often get nice hotels near the beach for less than 1000 Baht per night, and all hotels are hugely discounted from high season. See you here sometime!